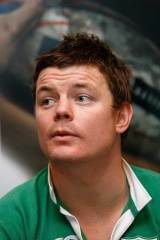 One of the most feared players in the game, Brian O'Driscoll has also been one of the most consistent since bursting onto the international stage over a decade ago. The all-time Irish record try scorer, O'Driscoll also led his country more times than any other player and his brilliant defensive qualities and dazzling attacking skills make him a threat all over the field. The Dublin-born centre made a rapid rise through the representative ranks, impressing at Ireland Schools, U19 and U21 levels - including victory at the IRB Under-19s World Championship in 1998. He claimed his first full cap aged 20 in a thumping by the Australians, later playing in all four of Ireland's games at the 1999 Rugby World Cup, scoring his first try against the USA. A hat-trick of tries against France to propel Ireland to their first win in Paris in 28 years in the 2000 Six Nations made him more widely known and won him his first Lions tour. In 2002 he became Ireland's captain through injury, taking on the role full-time on Keith Wood's retirement in 2004. That year he led Ireland to the Triple Crown and in 2005 led the Lions to New Zealand. Sadly his tour was ended with a disgraceful double tackle from All Blacks Tana Umaga and Keven Mealamu. He continued to lead Ireland by example and with success - three Triple Crowns in four years between 2004 and 2007 - and in the last of those years he broke Wood's captaincy record of 36 Tests. He was also named as the Player of the Six Nations in both 2006 and 2007. Injuries then started to take a toll and he missed the 2007 World Cup, but when he did play he continued to be a match-winner. In 2009 he led his country to a long-awaited Grand Slam - only their second clean sweep and first for 61 years. His performances also saw him honoured once again with the Player of the Championship award. Selection for his third British & Irish Lions tour followed later the same year before he helped steer Leinster to their first-ever Heineken Cup triumph. His 100th cap came in 2010 but he was having to increasingly coax his battered body through matches as Ireland struggled to repeat earlier successes. He did lead Ireland into the quarter-finals of the 2011 World Cup but surgery in the aftermath of the tournament subsequently ruled him out of the 2012 Six Nations. In 2013 he was overlooked as captain and his international season for Ireland - and possibly career - ended on a sour note when he was sin-binned in Ireland's final day defeat to Italy. He was still picked for a fourth and final Lions tour but was controversially dropped from the series decider. The decision caused much discussion but the Lions ultimately won the series by defeating the Wallabies in the final test in Sydney and, despite watching from the stands, O'Driscoll finally added a victorious Lions test series to his CV.